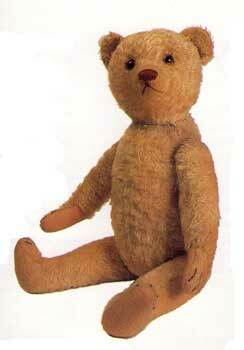 Vintage bears from the Bing Company can look rather like early Steiff bears. In fact early on there were legal proceedings taken by the Steiff company to protect their brand and help to distinguish their bears from Bing's, by preventing Bing using a button in the ear as their trade mark. Bing Teddies are certainly considered collectible bears and the early bears do come under the heading of antique teddy bears. If you are considering seriously collecting teddy bears then a Bing bear is certainly one to look out for. Very early Bing teddy bears had a metal shaped signal in the ear, these were changed after legal proceedings taken by Steiff. It is very rare to find antique teddy bears from Bing with this tag. Early Bing Mechanical bears carry a metal button on their bodies marked DRPDIVDRGM - this is a patent pending mark.